Growing in Grace Podcast: 640. 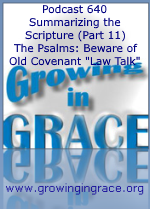 Summarizing the Scripture (Part 11): The Psalms: Beware of Old Covenant "Law Talk"
640. 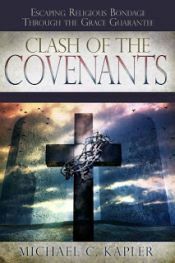 Summarizing the Scripture (Part 11): The Psalms: Beware of Old Covenant "Law Talk"
It’s common for Christians to seek comfort and direction when reading the Bible, and the Psalms and Proverbs are often one of the first places people will turn for guidance. However, it is frequently assumed that everything within the Psalms is pointing us towards precepts and principles that are not necessarily meant to be applied for us who are in Christ, living in a New Covenant. We’ll find all kinds of passages written from a very different perspective from those who were under the burden of the impossible law… something from which people have been delivered from since the cross.